At Pragati Leadership’s flagship annual event, Carpe Diem, the first speaker was James Brook, Co-Founder and MD, Strengths Partnership. 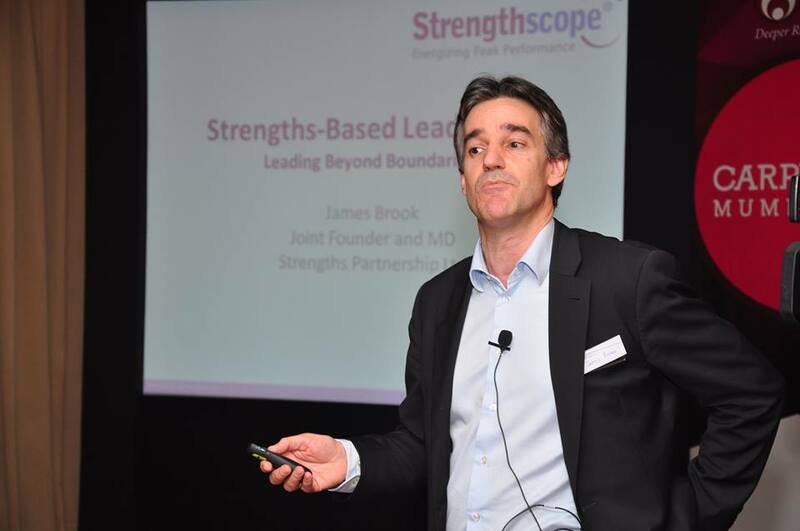 James spoke on the “Strengths Based Approach to Leadership”. Mr. Brook began his talk with thoughts on the strengths based approach to leadership development, and how it challenges the traditional assumptions of leadership. He pointed out that organizations are investing so much into leadership development, that when combined, these investments equal the GDP of a small country. Yet there are not many promising leaders out there today. This is because employee engagement is deteriorating. An indicator of failed leadership would be the many scandals that are unearthed regularly. There is a lack of longevity in the process of leadership. All this suggests that the development is not working in the right direction. He threw light on these issues by saying that it is not necessary for leaders to be well rounded. Effective leaders like Steve Jobs for example focus on their key strengths and work on them. Not all leaders have the same strengths, but the best ones build on their strengths and conquer their weaknesses to move forward. He went on to discuss whether leaders are always right and do they know it all, then went further to say that this is not mandatory. A good leader is someone who appreciates and inculcates the importance of strengths, gives direction, goes beyond the usual and engages every team member. From a psychology perspective, he shared that strengths are innate and developed mostly during childhood but behavior is something that can be learned and implemented strategically. In conclusion he emphasized that stretching strengths beyond the comfort zone will help a person to grow. 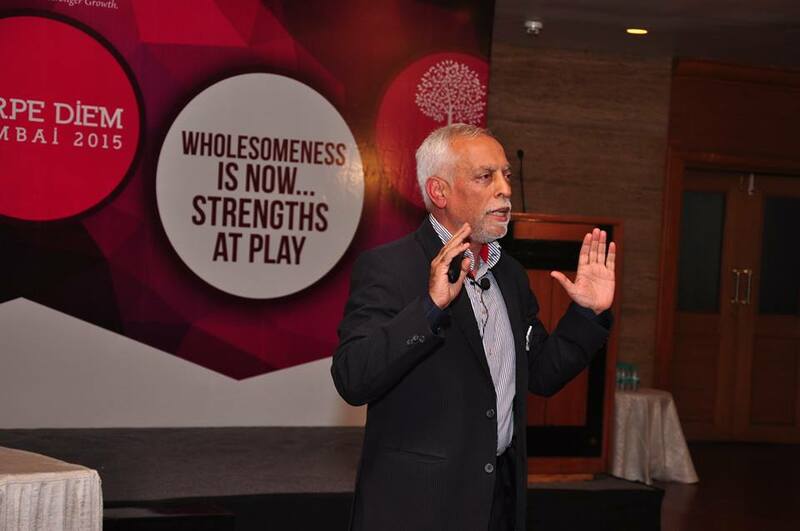 The second speaker, Arun Wakhlu (Founder and Executive Chairman, Pragati Leadership) spoke about “Exploring the Core Strength of Wholesome Leadership™”. He commenced the session with his trademark ‘Namaste’, a traditional India greeting. He went on to emphasize the importance of understanding the kind of leadership that is needed for the good of the world, and the dangers facing the world not getting the necessary attention. “What kind of leaders, are needed to create a truly progressive world?” He questioned. Arun went on to share that leaders who can inspire and energize, those who are fueled on passion and energy are needed. The one thing that is not given importance, is our strengths, this is the missing element that hinders our productivity on the path of Wholesome Leadership™. Two things that need focus are Context, ie., running a business holistically and looking at the bigger picture. The second is Consciousness, ie., living in the moment, taking each day and each opportunity, one at a time. It is pointless carrying the baggage of the past and anticipating the future, for our actions are determined on the basis of how we see things. Arun raised the question “What are the effects of this ‘baggage’ on productivity?”. A general consensus among the members of the audience was that it caused loss of energy, time and positivity.